Love her horns, and she loves to be scratched. Her pedigree speaks for itself. She is bred for late spring to WB Midnight Alarm. This Sweet Chex daughter (JP Rio Grande X BL Sweetcheeks) is the entire package and spent two seasons in the Longhorn Project at Johnson Space Center. Puppy dog gentle! Confirmed bred to CR Red Hot Texan for late Spring 2019. "Valentine" has just weaned her first gorgeous heifer! She is bred back to CR Red Hot Texan for Spring, 2019. You just can't go wrong with twist like this. Daydreamer is a beautiful brindle cow who has given us 4 outstanding heifers who are growing a ton of horn! Top producing cow, super milker. Peacemaker granddaughter. We are keeping 2 of her daughters. She is bred back to CR Red Hot Texan for April, 2019. Brindle with horns rolling back over now. She Just had a colorful bull by CR Red Hot Texan 3-17-19. Just weaned a gorgeous brindle & white Winizm daughter. She is bred to CR Red Hot Texan for Fall. Sold for $27,000 at the 2015 Red McCombs Fiesta Heifer Sale. Gave us a beautiful brindle heifer by CR Red Hot Texan on March 15. Quiet & easy to work. Sells bred to WB Midnight Alarm for April, 2019. Horns are really growing right now! Black & White, "Blue" Roan and bred for Fall to CR Red Hot Texan. 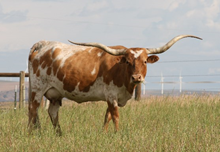 This baby could have it all: Red Hot Texan is throwing the horn, disposition and size/conformation!